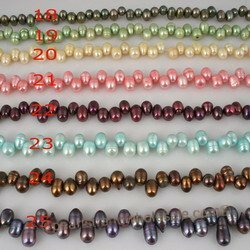 Pearstrandwholesale.com has the largest selection of freshwater dancing pearl in different color,size&quality! 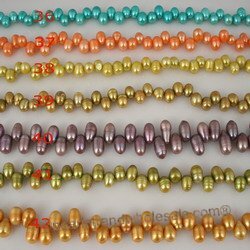 Knowledge: Dancing pearl also call top-drilled Pearl beads,freshwater Dancing pearls. These pearlsthat have been drilled through the end of the pearl instead of through the center. Shapes used for these strands are typically rice or egg shaped pearls. Occasionally we have access to other end-drilled shapes! Pearl Quality: Normal luster, Moderate dimple.